Their wood-fired cuisine has got us all fired up. Open from 11:30 a.m. to 2:00 a.m.
Stella’s cuisine: rustic, organic, different. Click for more. (SPOT.ph) Despite cooking up a storm as the executive chef for Raintree Restaurants-Chelsea Cafe, Momo, Mr. Jones, and Museum Cafe-Kalel Chan isn’t averse to a new challenge. 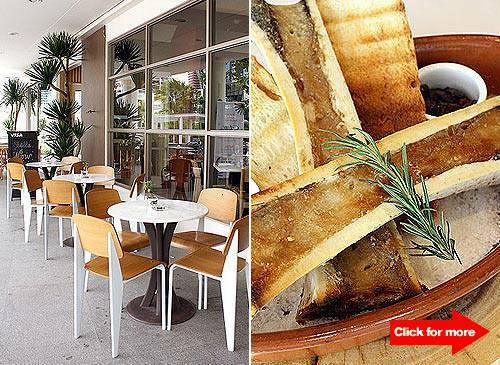 Stella, one of the new restaurants at Bonifacio High Street Central, offered the chef a chance to stretch some new culinary muscles, thanks to a wood-fired brick oven that is the heart of Raintree’s latest. The result? A set of smoky, flavorful, and, oh yeah, totally trippy dishes. 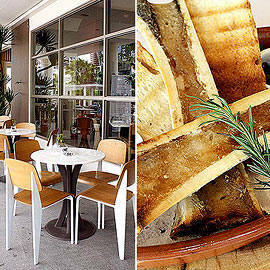 For starters, check out the baked Bone Marrow (₱395). A totally different experience from that other famous marrow dish, bulalo, you scrape the fatty matter out of the sliced bone, spoon it into a focaccia crisp, and add a smidgen of the rosemary sultana compote and gremolata provided on the side. It’s a rich, heart-stopping appetizer. Angling for something lighter? Snap up the Grilled Pulpo Salad (₱595). The chewy octopus is so flavorful, it deserves repeat orders. Wood-fired pizzas are, expectedly enough, Stella’s main course bestseller. The oven lends a burnt, uneven texture to the crust, giving it a character not usually found in the Metro’s bland-ified pizza offerings. We tried the Butcher’s Best (₱325) and Fire Roasted Truffled Mushroom (₱350); both were robust, aromatic, and crunchy. For mains, though, our heart goes to the Salt Baked Gindara Fillet (₱395). Baked inside salt encrusted flour, the server slices open the top to reveal a heavenly fish fillet that’s so creamy and light you really don’t need the provided sauce. We also love the Indian Spiced Chicken Brochettes (₱395); the chicken is oh-so-tender, while the spices are more subtle than overpowering. Belly full to bursting? No surprise there. Clear your palate with a digestif or two next door (as in, literally next door-they even share the same kitchen) in Stella’s sister lounge, the Rocket Room. Chef Kalel and Raintree also handle it. We did check it out too, but that’s a story for another time.